John Neumann was born on March 28, 1811, in Bohemia, now part of the Czech Republic. His parents were Philip and Agnes Neumann. He had four sisters and a brother. After college, John entered the seminary. When the time came for his ordination, the bishop was sick and the date was never rescheduled as Bohemia had enough priests at the time. Since he had been reading about missionary activities in the United States, John decided to go to America and request to be ordained there. He walked most of the way to France and then boarded a ship to New York. 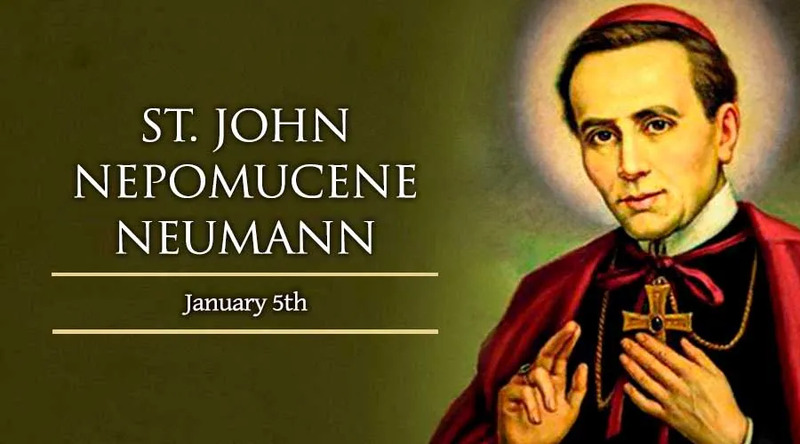 John arrived in Manhattan on June 9, 1836, where he was gladly welcomed by Bishop John Dubois, who at that time had only 36 priests for the 200,000 Catholics living in the state of New York and part of New Jersey. Just 16 days after his arrival, John was ordained a priest and sent to Buffalo. Father John established himself in a small log parish house. He hardly ever lit a fire and often lived on only bread and water. He joined the Redemptorist order and continued his missionary work until he was elected bishop of Philadelphia in 1852. As bishop, Neumann built 50 churches and began the constuction of a cathedral. He opened almost 100 schools, and the number of parochial school students grew from 500 to 9,000. He died suddenly on January 5, 1860. He became the first American bishop to be beatified. He was canonized by Pope Paul VI on June 19, 1977. He is buried in St. Peter the Apostle Church in Philadelphia.